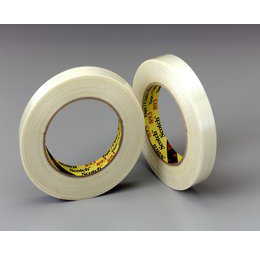 Scotch® Filament Tape 893 is polypropylene film reinforced with glass yarns for added strength and extra security for box contents and bundles during shipping and handling. Our specially formulated rubber resin adhesive sticks quickly to metal, plastic and fiberboard. Clear backing provides excellent abrasion and moisture resistance while allowing brands, bar codes and graphics to show through.